History of Herbs of Mexico : Herbs of Mexico, Health. Wellness. You. The history behind Herbs of Mexico is as unique and colorful as its retail store. The concept was originated by Morris Baker, in the 1960's, when he opened a little retail store in East Los Angeles. It quickly gained popularity throughout Southern California as a place to buy herbs at affordable prices. Baker, himself became well known for publishing J.M. Nickell's Botanical Ready Reference Guide. As the store prospered, it caught the attention of a Costa Rican immigrant named George Cervilla. In 1965, Cervilla approached Baker with an offer to buy the store. Baker agreed, thus beginning the multi-generation ownership of Herbs of Mexico. With his knowledge of Latin American herbs, Cervilla quickly built a reputation as a master herbalist and the store continued to gain loyal customers. He developed a fine line of natural powdered herbal combinations that were used in teas and capsules. To this day, the formulas for these herbal combinations have not changed and remain quite popular with customers. In 1980, Cervilla retired and entrusted his sons with the business. 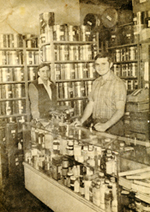 Roland, Alven and Bob inherited their father's knowledge and continued on with the store's rich tradition. In 2006, Martin Lopez, a former employee and life-long customer joined Bob Cervilla as a managing partner. Together they continue to grow the Herbs of Mexico legacy. Today the store carries over 450 bulk herbs from around the world and over 400 other products such as essential oils, vitamins, creams and remedies. In its 45 year history, the store's charm remains the same. When neighbors enter the store, a subtle herbal ambience is detected. Looking around, one can tell that nature's medicines are in their purest form stored in brass containers of all shapes and sizes. The air permeates with a subdued herbal smell - one which nips at the edges of the old factory. Customers note the fast and friendly service of the staff. 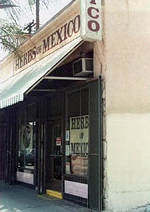 Herbs of Mexico has had a long standing tradition of providing the best products and services to its customers. If the past is any indication, this tradition will continue for many generations to come.